In 1987, the magnificent old church of Agia Kyriaki Chrysopolitissa(also known as The Church at St Paul’s Pillar)was entrusted to us by kind permission of Bishop Chrysostomos, the then Metropolitan of Paphos. In 1988 the Anglican Community accepted the invitation initially declined in 1986 to join us in using the church for their Sunday worship and the Lutheran and Maronite also gather there on certain occasions. The Orthodox community still holds some services in the church particularly on 29thJune, the feast of Saints Peter and Paul. Masses are also celebrated in St Dimitri’s Churchin Polis, again by kind permission of the Orthodox community, and at the Latin Parish Hallon the Tombs of the Kings Road, Chloraka. 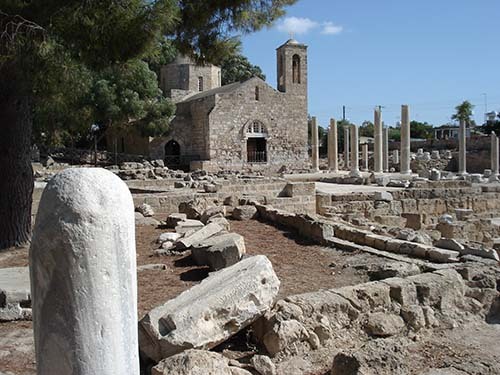 The Latin Parish of St Paul’s in Paphos belongs to the Patriarchate of Jerusalem. The Parish is a lively Catholic community of people from all walks of life and from an increasing list of overseas originations as well as many hundreds of Tourists/Visitors from all over the world but especially from the UK. The Latin Parish Hall is a well-used social venue for all sorts of events including regular Parish Lunches and celebratory occasions. At Mesa Chorio, a small village to the north of Paphos, we have a cemetery and a chapel dedicated to Saints Cosmos and Damian. On the neighbouring site is the Archangel Michael Hospice– the first Hospice in the eastern Mediterranean – the development of which was led by the Catholic community of Paphos (which cares for people of all faiths or none). It is more a Community Project. Parish activities include a Pastoral Care Group incorporating hospital and visiting the sick, a Bereavement Support Group, a Choir, a Rosary Team, flower arranging classes, line dancing, the “100 Prize Draw” club and lots more…. In addition the Parish operates a “Charity Shop” and Cafe to raise funds for the Hospice selling hand-made greetings cards, prayer cards/bookmarks etc as well as donated “pre-owned” clothes, books and many items etc.